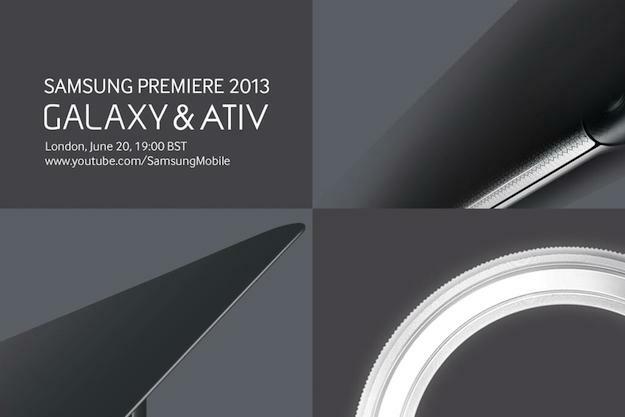 Samsung has tweeted it will hold a special event on June 20 in London, where it will reveal new Galaxy and ATIV hardware. The accompanying image, which you can see above, shows three different close-up shots of an unknown product, or products. The bottom left image could be an open laptop shell, while the upper right could be the same device when closed. As for the bottom right, we’ve no idea. The Galaxy branding has exclusively been attached to mobile hardware, and as the tweet came from the Samsung Mobile account, it’s reasonable to expect at least one new device to be announced on the day. There’s no shortage of potential candidates either. The Samsung Galaxy S4 Mini, coincidentally, has shown up on Samsung’s own website this week, which indicates not only that the phone is real, but it’s coming soon. A dedicated event for the S4 Mini – which is likely to be rather mundane, specs wise, in comparison to its namesake – seems unlikely, so this could be the day we get to see the S4’s extended family. We’ve already had a look at the rugged Galaxy S4 Active, while the Galaxy S4 Zoom with an improved camera, and the mysterious Galaxy S4 Mega could join the smallest and the toughest S4 phone variants. Galaxy Tablets and ATIV Windows devices too? Apart from smartphones, the Galaxy name is also used for Samsung’s tablet range, and the Galaxy Tab 3 8.0, and the Tab 3 10.1 have both been the subject of leaks recently, following the low-key launch of the Galaxy Tab 3 7.0. But Samsung’s event isn’t only about Galaxy hardware, as the hugely popular brand will have to share the spotlight with some ATIV devices too. Samsung hasn’t really bothered with Windows Phone 8, with last year’s ATIV S smartphone being forgotten, but it may not want to leave Nokia’s control of the market go unanswered, so a new Windows Phone smartphone is at least a possibility. However, while the ATIV name initially related only to Windows Phone and Windows RT products, Samsung recently expanded the ATIV brand to cover all its Windows PCs; and sure enough, a check of the Samsung Notebook Twitter account shows it is also promoting the June 20 event. Could it be the launchpad for the first Samsung laptop with a 13.3-inch, 3200 x 1800 pixel resolution screen? Samsung isn’t labeling this as an Unpacked event, but will be live streaming it on YouTube as usual, with the action starting at 7pm local time, 1pm ET, on June 20. We’ll bring you all the news as it happens.